When Chris Gayle hit Rahul Sharma for five consecutive sixes in an IPL match in April, I found myself wondering not about Gayle's brute strength or his ability to hit sixes at will but the spinner's response to the onslaught. Would he slow it down, bowl a googly or try a big spinner? Sharma changed his lines and lengths, but didn't significantly change his pace or variations. If anything, he bowled a bit quicker. Since he is believed to have modelled his action on the great Anil Kumble, it's worth deliberating how Kumble would have responded to such a situation. My educated guess tells me Kumble may have bowled a couple of googlies, taken the pace off another two, or tried a flipper, bowling it faster and pitching it short of a good length, so it skidded off the surface and forced Gayle to pull. All this may or may not have changed the outcome but the use of spinner's most potent weapon, deception, would definitely have made a contest of it. Since Sharma is still cutting his teeth at international cricket, it's unfair to compare him to a man who has taken 600 Test wickets. But I like to believe that Kumble got to that milestone because of his desire to try something new each time, and not that he experimented only because he had a pile of wickets to support him. After all, records don't make men great; great men make records. Let's take a look at how other spinners who have a realistic chance of playing for India in the next few years have responded in similar situations. In the IPL, every time a left-hand batsman went after his bowling, Pragyan Ojha responded with yorkers aimed at the batsman's toes. Some missed their mark by a few inches, some were deposited into the stands by the likes of Gayle, and others went wide down the leg side. 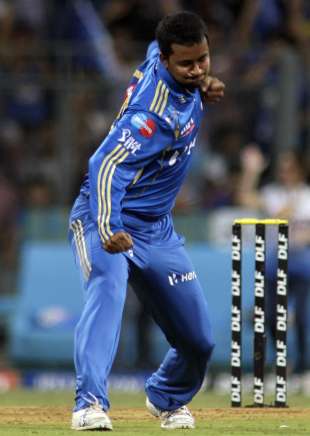 Even Harbhajan Singh, despite his considerable experience, was guilty of bowling flat or fast yorkers under pressure. Would Muttiah Muralitharan and Daniel Vettori have responded differently? Having watched them play in the IPL for the last five years, it's fair to say that both have enough tricks in the bag to not have to resort to bowling flat in these situations. Murali rarely bowls a yorker, for his strength lies in extracting spin off the surface and disguising his doosra. Vettori slows it down, keeps the ball hanging in the air for a fraction longer and changes his line to counter the onslaught. R Ashwin is perhaps the only Indian fingerspinner willing to flight the ball, but unfortunately he too seems to be falling into the trap of bowling only doosras and carrom balls. He has compromised on a spinner's biggest strength, the ability to turn the ball, and his performance in Test cricket is getting affected by it. Not surprisingly, legspinners Piyush Chawla and Amit Mishra refrained from bowling yorkers, because leggies struggle to find the blockhole at will. Mishra bowled variations in the latter part of the tournament, but Chawla wasn't too inclined to turn the ball away from the right-handers. While it's a given that the best fast bowlers in the IPL will be overseas players, it's a worry if the best spinners are not Indian. But it's not just the IPL; there are no good spinners on India's domestic circuit either. Few try to get drift in the air or put enough revolutions on the ball to extract spin and bounce off the surface. Most spinners are just slow bowlers who break the monotony of seam bowling. As young batsmen we were told to spend quality time honing our skills to defend against the turning ball. It was imperative to transfer the weight at just the right time, keep the bottom hand loose always, and play close to the body. To succeed in first-class cricket you had to have a solid defence and the ability to hit the turning ball along the ground. We practised these by playing with a tennis ball from a short distance. Even then, hours of training weren't enough every time, because spinners like Bharati Vij, Venkatapathy Raju, Sunil Joshi, Kanwaljit Singh and others would use the SG Test ball to their advantage and extract both drift and spin. They would rarely bowl flat and fast, because even a batsman's fiercest assault could be countered by deception. Turning the ball a bit more than expected to get bat-pad dismissals, beating the batsman in the drift and forcing him to edge it to slip, or exploiting poor weight transfer by getting the batsman caught at short cover or midwicket were regular modes of dismissals. As a batsman, it was imperative to look for the shiny side even when facing spinners, for that helped you read the direction of the drift and the arm balls. Today, even talking about all this makes me feel nostalgic because I can't name a single spinner in the domestic circuit who uses these skills. I also don't see batsmen spending hours to get their forward defence watertight against spin. The only thing a modern batsman does is place the bat in front of the front pad to avoid lbw decisions. Most spinners, not looking to extract any turn, try to bowl wicket to wicket, expecting to get leg-before decisions in case the batsman misses the line. Fielders at short leg and silly point are of ornamental value, except on rank turners. This is a sorry state of affairs for a country that boasted many fine spinners. The deterioration in the quality of spin started about a decade ago, but the IPL has aggravated it. Anyone willing to practise the traditional craft of spin bowling is routinely overlooked by the IPL talent scouts. The temptation of making it into an IPL team is so huge that compromising flight and spin for accuracy and flatter trajectories seems a small price to pay. While there were many young left-arm spinners on show this IPL season, not one of them bowled with a high-arm action or looked suitable for the longer version of the game. The moment you bowl with a round-arm action and lower your arm, you cease to get bounce off the surface. It also doesn't allow you to put enough revolutions on the ball to get spin off the surface, which is why such bowlers rely heavily on dusty pitches to spin the ball. It is a lovely sight to watch batsmen struggling to dig out accurate yorkers, but only if the practitioner operating 22 yards away is a fast bowler, not a spinner.